It’s pretty sad, I guess, that my handsome husband and I sometimes look forward to his retirement, the kids being grown, and downsizing. Don’t get me wrong, I love, love, love our family and our life; it’s more than we ever hoped for. But the husband’s job can be a pretty big emotional drain, kids can be utterly exhausting and frustrating, and we frequently feel we don’t have the energy, time, and resources to keep up the old house as we ought. Just a desire for less responsibility, you know? Downsizing sometimes seems attractive, but I truly treasure our antique house and it would be hard to move. I’d love to pass it on and see my grandchildren run around the same rooms our boys did. If that doesn’t happen, much as we might like to downsize 30 years from now, my husband and I hope live here indefinitely, preferably until they bury us in the little cemetery across the street! 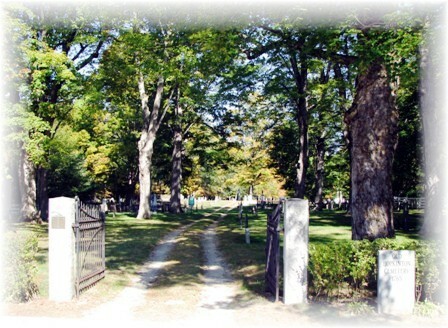 Wouldn’t you want to be buried here? I would have taken my own picture, but the cemetery is under 2 feet of snow again. Not terribly attractive at the moment, even for the deceased. It’s the question so many baby boomers, my parents included, face right now. Give up the family home for something more convenient, or stay on amidst the challenge of keeping up a large place? 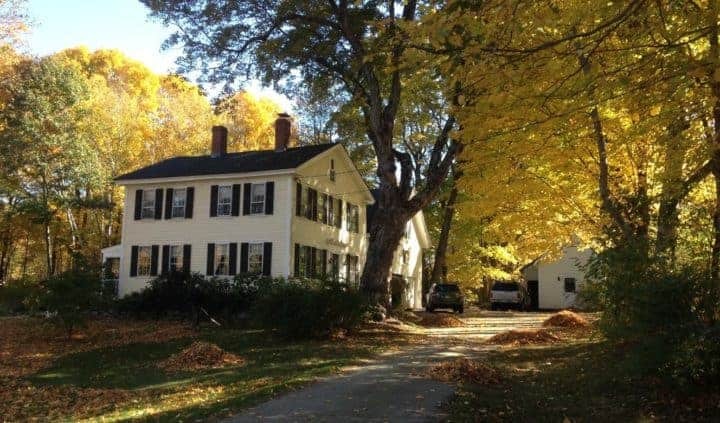 The owners of this 1805 Cape raised seven children under its roof. (Yikes! Makes me feel kinda sheepish about being overwhelmed sometimes by my two.) But by 2013, all of their kids had moved on and started families. They were ready for a change. They wanted to travel and, let’s admit it, worrying about your pipes freezing in January while you’re away on the beach in the Keys really puts a damper on your retirement years. They’d searched around for a smaller home but couldn’t find anything to compare with charm of their current place. 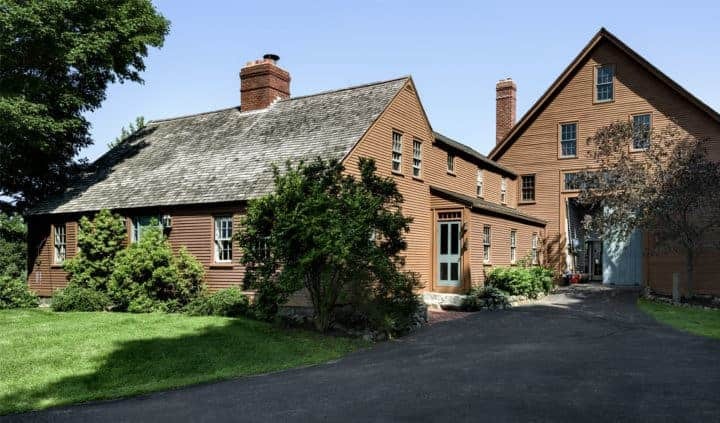 Like many old New England homes, their house is attached by an “ell” to a large barn, built in 1709 in this case. Here’s a view of the back side. Moooooooo. Very bucolic. Can’t say I blame them for not wanting to leave. But I’m looking at all that grass that needs to be mowed, too…. Over the years, they had hosted dozens of parties – even winter ones where guests were in ski jackets – under its enormous old rafters strung with Christmas lights. And though they didn’t want to convert the entire structure into living quarters for themselves (that, after all, would not be downsizing), they had an idea of some way converting part of it, thereby freeing the main house for one of their children and his family to move in. 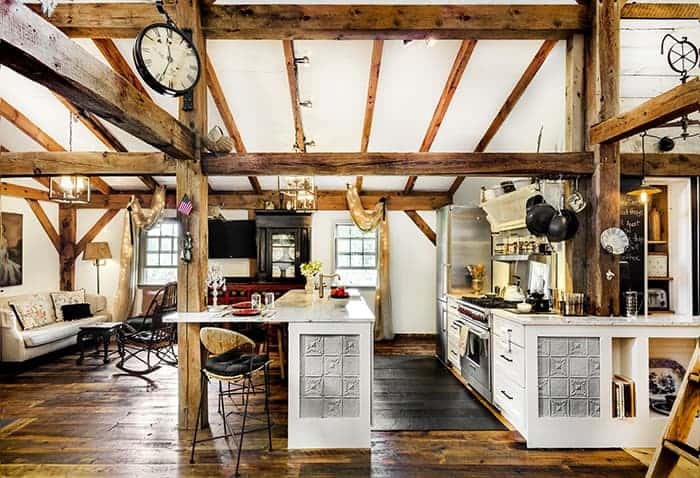 Very typical to New England, the barn consisted of three bays – left, central (where the main barn door entrance is) and right. The left bay was slightly larger due a small addition done at some point in the structure’s long history. The idea was to transform only the left bay/addition into their living space, to be accessed from the central bay through French doors. 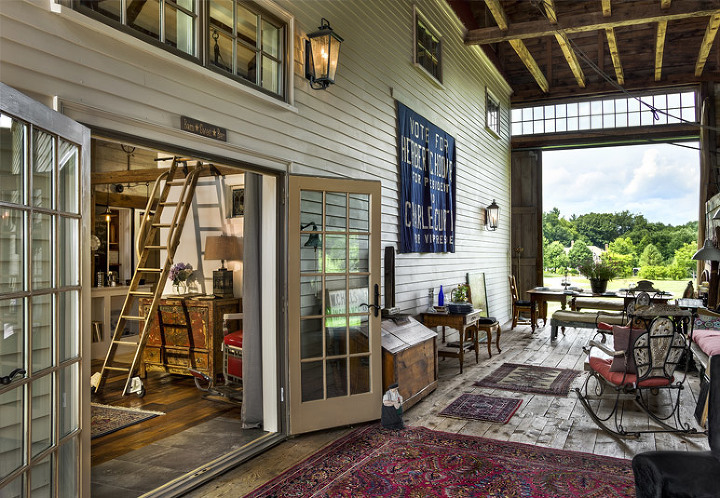 The central bay would serve a sort of front porch for entertaining and the right bay would stay barn space. 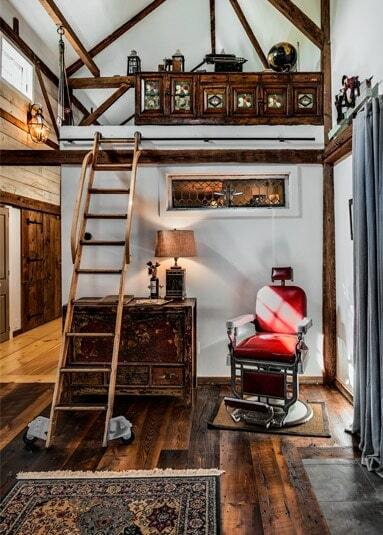 New loft space over living quarters, accessible by ladder. 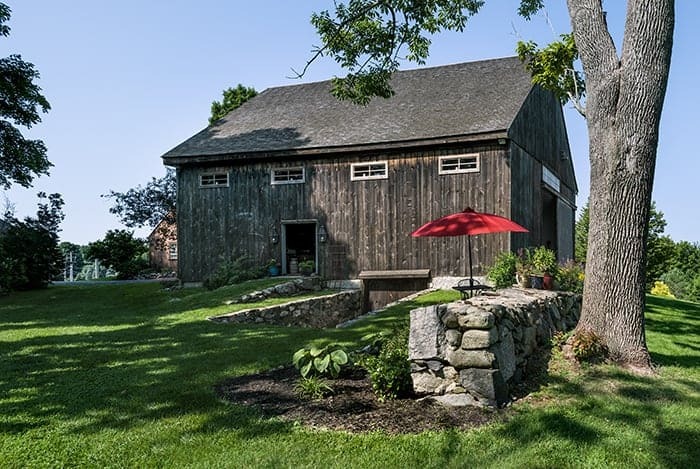 The exterior would remain virtually unchanged, in keeping with their wish to preserve the barn’s historical character as much as possible. See? 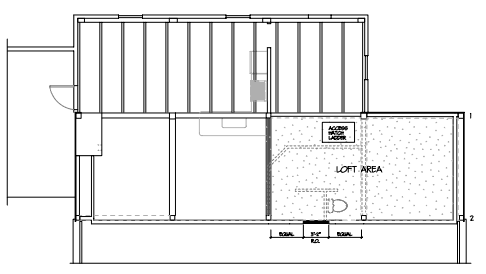 The biggest challenge of the project was that the bay of the barn was not very wide — only 11 or 12 feet. That’s pretty tight for a bedroom (though not much smaller than our master, which is only 13 x 13!). The biggest goal was to make it feel like one, unified space. 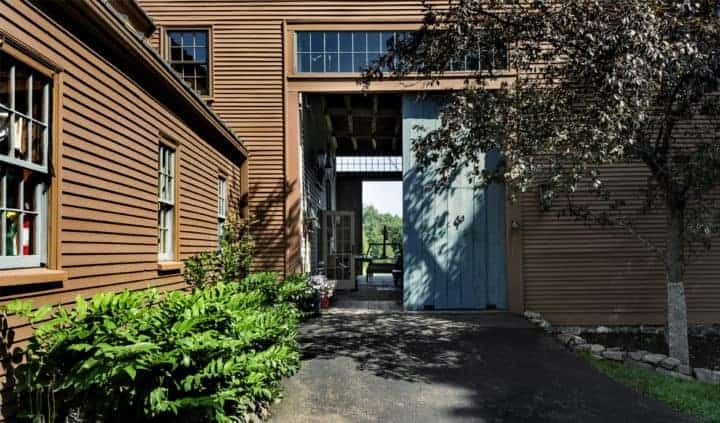 Shannon used pocket doors and barn doors that can open the whole space up for when the owners feel like having more room around them, making it feel bigger than it is on paper. 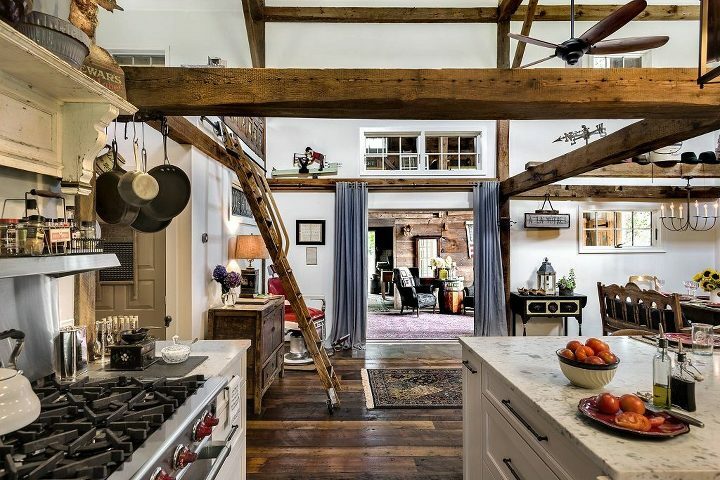 He left the original post-and-beam system intact and sistered on additional framing as needed. 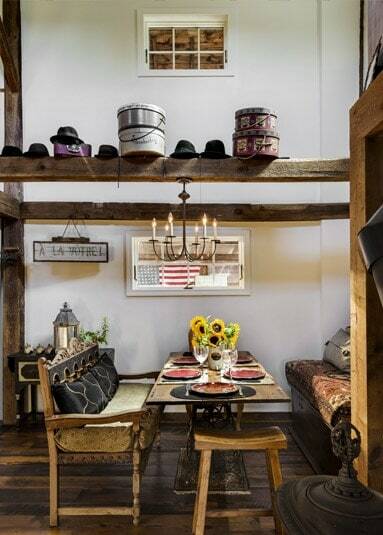 The homeowners masterfully oversaw all the interior decoration themselves, making it a mission to incorporate as many finds as possible from the old barn into the décor itself. In its recesses they found treasures galore!!!! 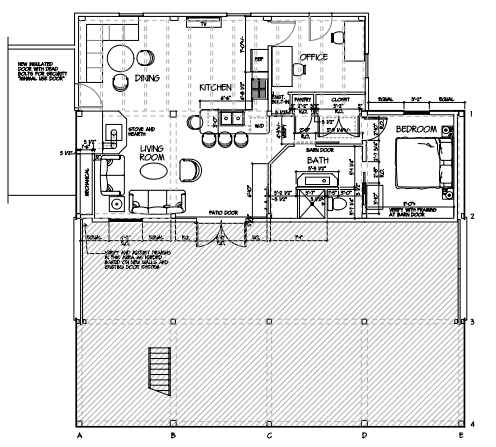 Kitchen and living room. A found copper pipe became a curtain rod for drapes covering the French doors to the main barn. The wee little master bedroom. 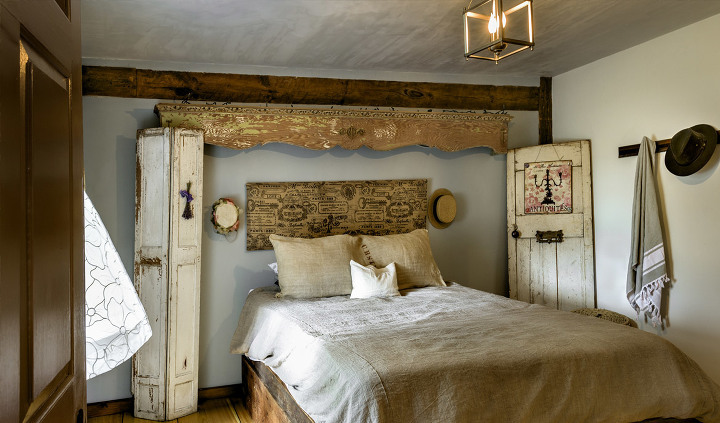 Planks and old drawers found in the barn were used to create a bed frame with storage. 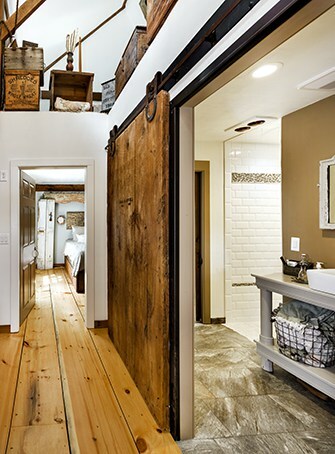 The large sliding door to the bathroom was created from an old horse stall door. However, perhaps their most treasured piece of salvage is the kitchen table, made from an old door and a sewing machine base. The sewing machine had been in the barn from time immemorial, but when it was taken apart, the couple discovered a letter from a wartime husband to his wife saying how sad he was to miss Christmas at home. There’s a real tear-jerker for you. What I love about this project is how cozy everything turned out. 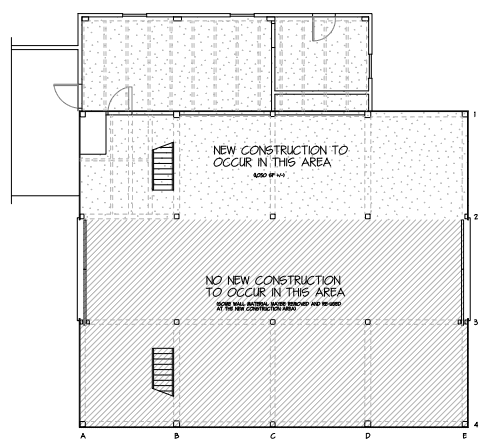 One of my biggest peeves with barn-as-house projects is they can end up feeling cavernous. Like there should still be birds flying through the rafters. Sounds like some times in our lives, too. 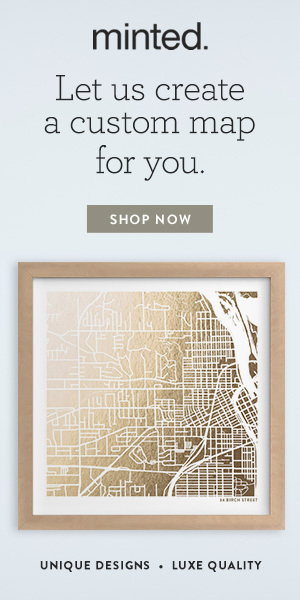 Next week, I’m going to give you a peek into the part of my house that is not on my portfolio page (I cringe!) — the part that’s awaiting a huge/decoration renovation project and what we’re considering/dreaming depending on finances. 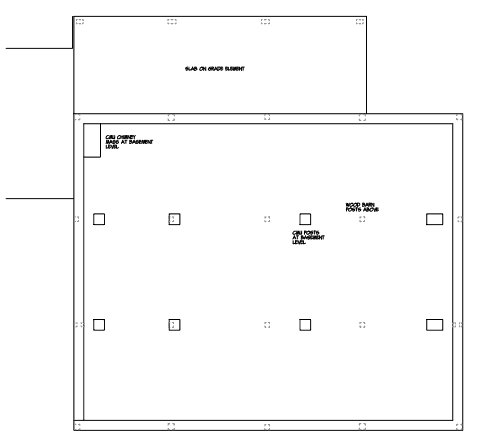 Mr. Alther will join me with some excellent input that can make your own out-of-this-world-of-possibility renovation pipe dreams more within the scope of reality.